Whether it's with tourists in the summer or among natives during the long, cold months, the state has many special places to visit. It’s morning on Labor Day and I’m headed north on Route 295. Well, more accurately northeast, with the cresting sun coming through my windshield. As I roll into Brunswick and onto Route 1, I’ve got open road before and behind me. The same can’t be said for those in the opposite lanes, where traffic has slowed to a crawl. There’s a rainbow of license places: Vermont’s green, New York’s yellow, the red and blue of Massachusetts and Delaware, rarely broken up by the familiar Maine black and white. It’s the first week of September and the exodus has begun. I’ve been in Maine long enough to know tourist season isn’t over (it seems to stretch closer and closer to Columbus Day each year), but it’s waning. Those who call Maine home for a week, or a month, or three months a year, are headed to figuratively and literally warmer climates. Like most Mainers, I have a complicated relationship with the boom-and-bust nature of tourist season (roughly defined as Memorial Day to Labor Day). There’s no question of its necessity to Maine’s vitality – according to data from Maine Revenue Services, $1.5 billion was spent on lodging and restaurants during those months in 2017, well over a third of annual taxable sales. On this Labor Day weekend, there were more than a million vehicles passing through the turnpike tolls. In a not-insignificant way, the largesse of those “from away” ensures the livelihood of natives, locals and transplants who tough out the stretch from Columbus Day to late spring. It also helps grow our state park system. As I approach the gate at Reid State Park in Georgetown, the ranger confirms I’m a Maine resident and waves me through, no fee required. From early August through Labor Day, fees at most state parks for Maine residents were waived by a financial order from Gov. LePage – recognition of record-breaking attendance in recent years. There were 2.45 million visitors to Maine state parks in 2017 and 2.6 million in 2016, the highest numbers in decades. Bearing right and heading toward the unpaved lot at the Little River Ledges between Mile and Half Mile Beach, I was reminded of the more taxing part of these visitors – the crowds. Oh, the crowds. The masses clogging traffic in downtown Wiscasset, lining the sides of Acadia’s Park Loop Road, making it impossible to get into your favorite restaurant for three months every year. As someone who tends to tackle adventures solo, the crush of people on popular hiking trails (your Tumbledowns, your Gulfs Hagas, your Precipi) can be maddening and detract from the beautiful solitude we seek in nature. At Reid, the beach is packed on what’s possibly the hottest day of the season. In 1946, Reid became the first state-owned saltwater beach in Maine, and in the intervening years its popularity has soared. Two long sand beaches distinguish it from the rocky shore of the surrounding midcoast. The tide comes, wave by wave, and blankets and parasols crowd the shrinking beach. Rather than fight for a spot, I change tack and head for the hiking trails. Two trails at Reid allow for a little more than three miles of hiking, on relatively flat terrain with a couple more moderate climbs. From a trailhead at the end of Seguinland Road, the Little River Trail follows its namesake north for a mile and a half before joining the Ski Loop Trail. The two-mile Ski Loop Trail, also accessible from two trailheads near the Ranger Station, sticks to the Little River before veering east, meeting Seguinland Road at Ice Pond (the scenic pond you pass just before entering the park). A hike was the right decision; I once again find solitude. Even with hundreds of people nearby on the beach, I haven’t met a single other person on the trails. Eventually, as the sun sags lower in the sky, I make my way back to the dunes of Mile Beach. 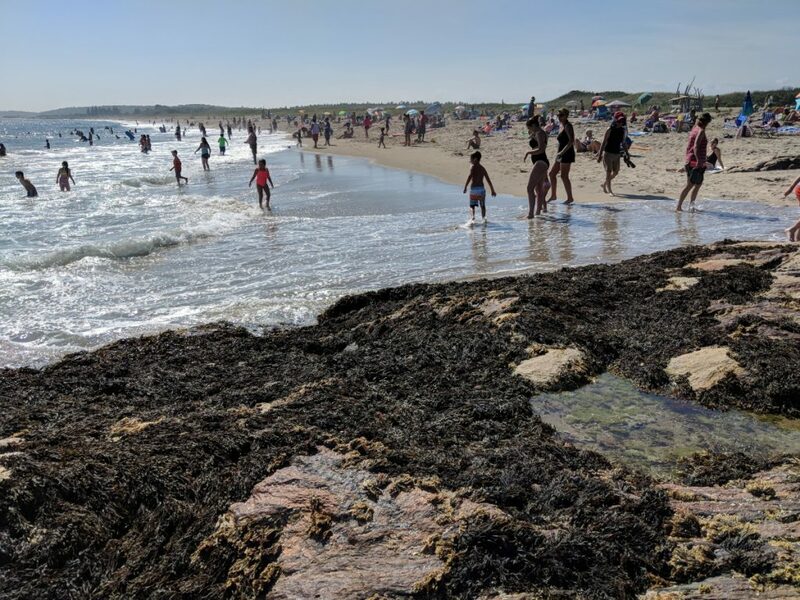 I find that while the crowds are clustered elbow to elbow (and blanket to blanket) on the beach near Outer Head and Todds Point, they thin and eventually disappear toward the center of the beach. Even on this busy day, a few extra minutes – and a few hundred yards of walking – grant me some privacy. It is a reminder that Maine is vast; nearly 280,000 acres of state parks (almost half a million if you include Baxter), 520,000 acres of public reserved lands, and well over 100,000 acres at Acadia and Katahdin Woods and Waters. Maine has the capacity to hold many visitors, even if it sometimes seems they’re inescapable. You just need to know where to look. It’s something my brother, late father and I have tried to convey with these columns. In his late 70s, my father remarked often on the myriad places in Maine he still wanted to visit, even after a life lived outdoors. May we never run out of places to explore, even in our own backyards.